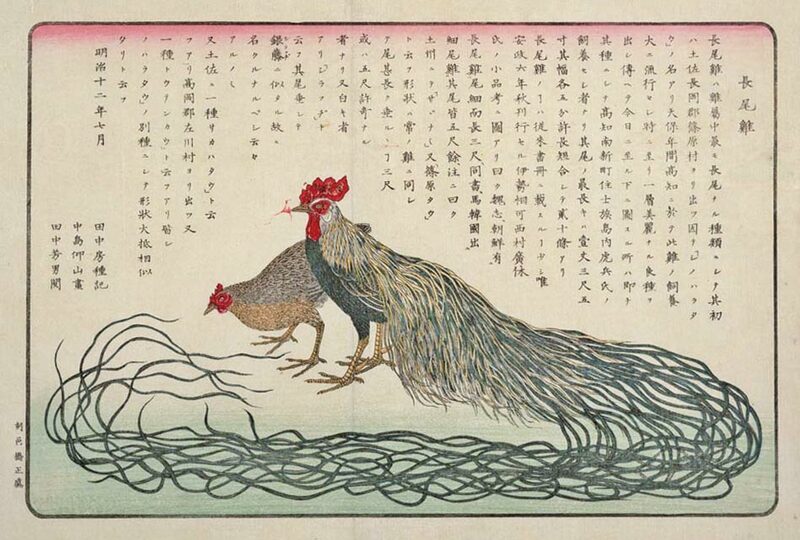 The Westerners who visited Japan from the end of Edo period to the early Meiji period, must have been amazed by the chicken with the long tail feathers reaching over 3 m. As one of the many unique products that were sent to Europe from Far East, Onagadori was sent to Europe as an amazing living creature. 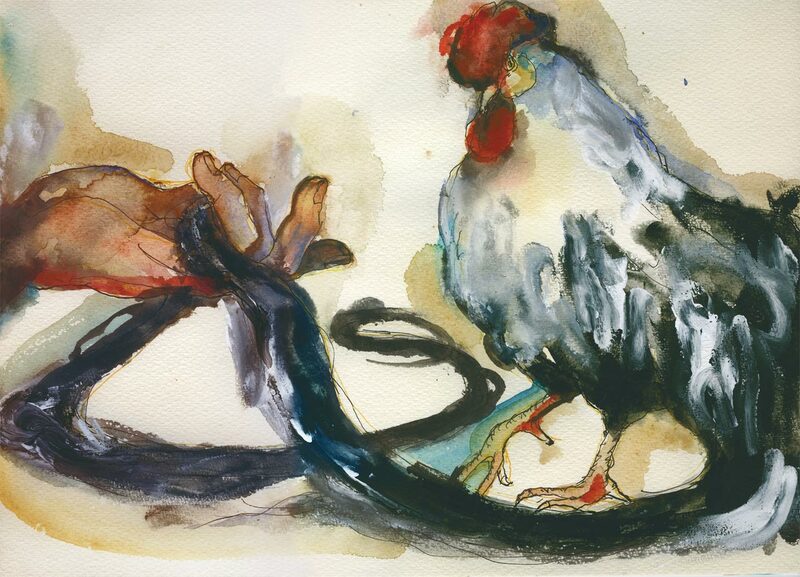 Many of the chicken breeds such as Leghorn and Minorca were named after the ports where they were shipped from. Chabo (Japanese bantam) used to be called Nagasaki when they were sent to Europe for the first time, and Yokohama for Onagadori. I have a book of Guinness World Records by animals issued in 1972, and there is a picture of Onagadori held by a man in kimono and the tail end by a boy. It was introduced as the bird with the longest tail feathers which were 20 ft (7 m) in length. The tail feathers of Onagadori used to be 3 m in 1830s, and if Siebold was there to see it, it would be about that size. 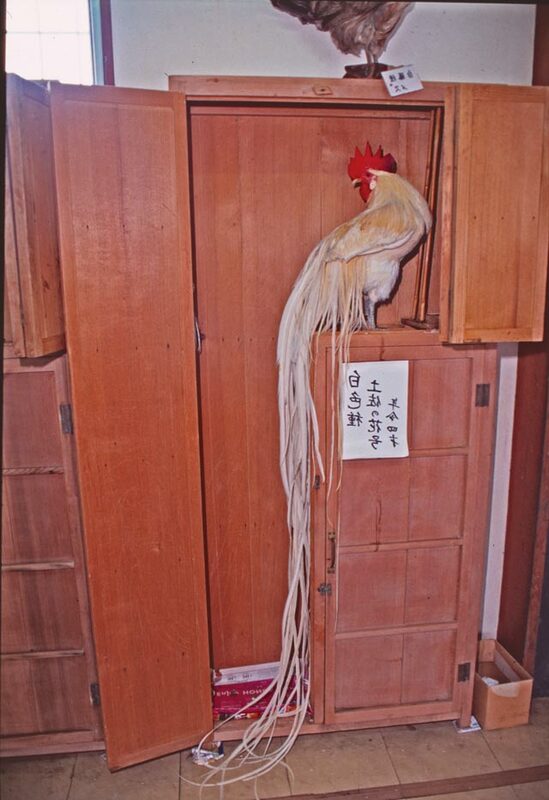 The tail feathers length was up to 4 m in the middle of Meiji period, and became 8m in the early Showa period, so the picture of Guinness book should be taken between the end of Taisho and the early Showa period. It was after the war when the tail’s length exceeded 10 m, and has reached 13.5 m at the longest to date. 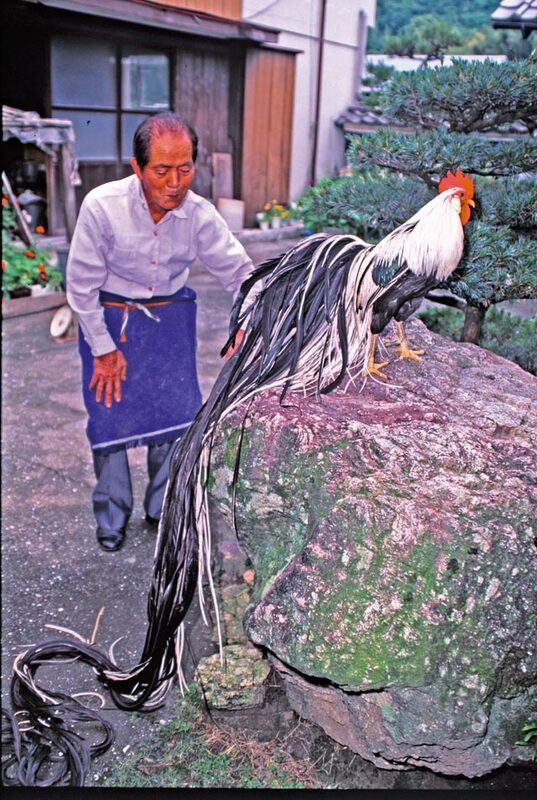 The Onagadori induced from selected chickens whose tail feathers don’t molt by mutation. There wasn’t a study of inbreeding at that time, but I can imagine that farmers selected the chickens with non-molting tails and raised them carefully. Onagadori wasn’t induced with just biological inbreeding methods, but also with the support of cultural background. During a journey to Edo for an alternate year attendance, the leader in the Daimyo’s procession of Lord Yamanouchi of Tosa domain adorned the sheath with Oganadori’s tail feather and that became popular. In the Tosa domain, farmers who provided the long tail feathers were rewarded and breeding was encouraged. Onagadori was a confidential matter in Tosa domain and they came to be known at the end of Edo period. Male birds are kept in the rearing cages called Tomebako, and accompanied by people who hold the tied tails to prevent them from tangling in their legs when they exercise. The tail feathers grow about 1 m per year and more likely to molt at the age of 3 and 5, but they grow to about 10 m if they past that period. Tails of the female birds don’t grow because they molt. Keeping the male birds with female birds in openspace breeding will cause the tails getting worn out, so male birds with long tails in the same group are used for breeding. Siblings of long tailed male birds fulfill a role of breeding hen for the next generation. I remember visiting a Chairman Masanori Tajima at the reservation society of Oshino Onagadori in Nangoku city about 20 years ago. I had always wanted to visit Tosa where a lot of special Japanese chicken breeds, some may look unusual, are bred and feel the cultural climate. First, I visited Dr Hidekazu Hiraoka who studies Onagadori at the live stock experimental station in Kochi prefecture and heard the story about Japanese chicken in Tosa. He showed me a variety of Japanese chicken originated in Tosa such as Totenko, Ko-jidori, Uzurao and Ohiki, but Onagadori with long tail wasn’t there. Out of 17 kinds of Japanese chicken which are designated as natural treasure, five of them were induced in Tosa. In 1923 ( Taisho 12th), Onagadori was designated as natural treasure and in 1952 ( Showa 27th), it was promoted to special natural treasure. 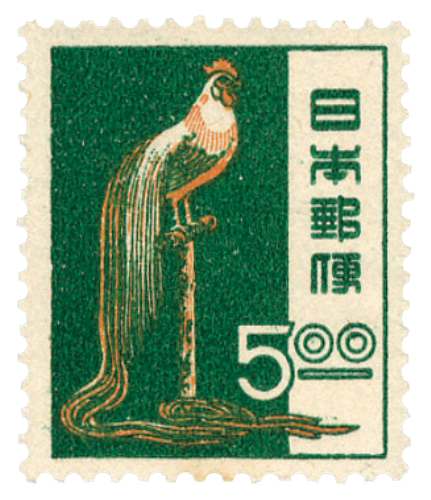 Ko-jidori, also called Tosa-jidori inherited the feather color from ancient chicken Red junglefowl and features from ancestral chicken. Totenko is Tomaru of Niigata prefecture and with Koeyoshi of Akita prefecture, both are best known for their exceptionally long crows, which can be sustained for up to 25 seconds. 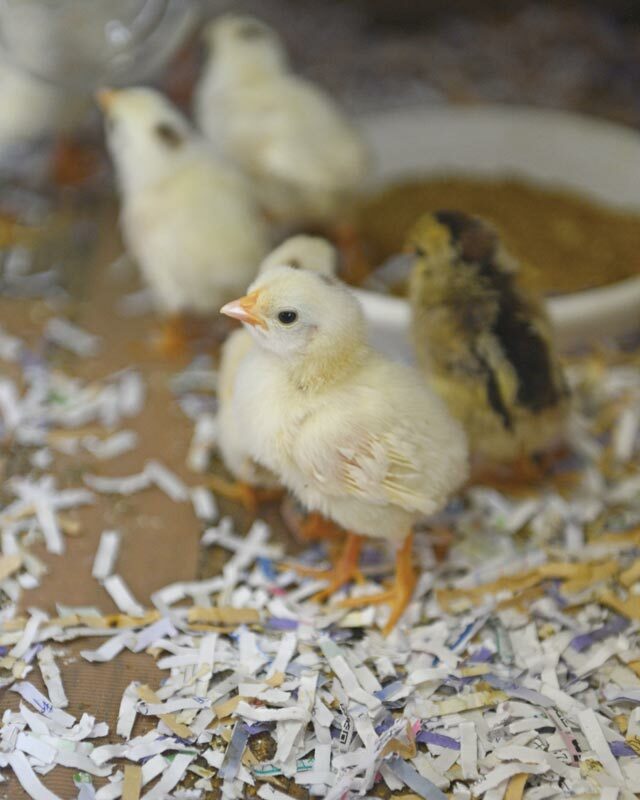 Although Uzurao and Ohiki are also called Uzura-chabo or Minohiki-chabo, they are not chabo (bantam) but actually are small chicken bred from Ko-jidori. Ohiki have long tails and look like small Onagadori. On the other hand, Uzuraoposite don’t have tailbone or tail feather, so to say directly op of Ohiki and Onagadori, but the way feathers in the back wrap the lower body look charming. Dr Hiraoka guided me to see Chairman Tajima and there I saw the Onagadori of which he is proud. Chairman Tajima brought a beautiful Onagadori out from a box and put it on a big rock in front of the walls covered with square tiles jointed with raised plaster. 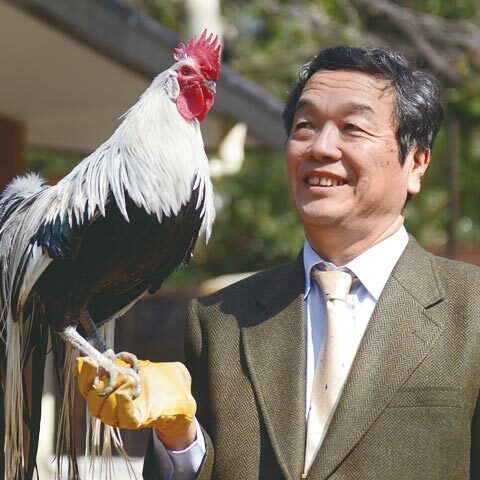 Chairman Tajima, who was over 80 years old, slouched along with the bird holding its tail feathers everyday for exercise. It is a hard painstaking job and I felt the patience of people in Tosa. Patience, enthusiasm, power of observation, which don’t miss any changes, and curiosity for creating new breed must have been nurtured in this climate where a variety of Japanese chicken were bred. Chairman Tajima mentioned a dif ficulty of having a successor, and I understand the difficulty of finding a young person who wants to take the hard painstaking job. The youngest person in the reservation society is in his 50’s. Mr Tojima smiled and told me that was his son. This is the year of the chicken, and I hope our worldclass treasure of Tosa will always be inherited as Japanese genetic resource as well as living cultural property of Japan.